Times are subject to change. See individual menus for specific serving times. 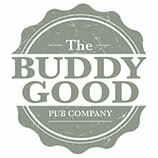 Buddy Good Pub Co welcomes children of all ages however we do ask that children are supervised at all times and remain at the table where possible. Thank you for your cooperation. The management have the right to withdraw offers at any time. Please ask your server if you require information regarding allergies or intolerances Following recent guidelines from the FSA all burgers must be thoroughly cooked. “Buddy Good Sauces” - all of our sauces are available to buy @ £1.95 per item. All dishes are subject to availability of fresh produce and may vary. Please be aware our food may contain traces of nuts.